The third BHECON forum in Connecticut welcomed state legislators and policymakers to learn about the important sources of coverage and care for individuals with mental illness. 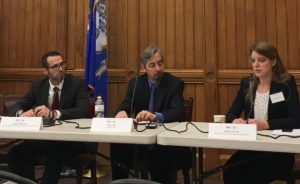 The forum featured presentations from national experts describing the costs of mental illness in Connecticut and the role of Medicaid and other funding sources in providing mental health treatment for patients. Overall, attendees gained an understanding that each mental health funding source plays a unique and vital role in providing a full continuum of care for individuals with mental illness. 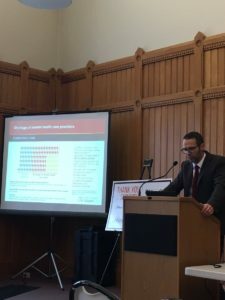 Dr. Michael Menchine of the University of Southern California’s Schaeffer Center for Health Policy and Economics opened the day’s discussion with data on Connecticut’s mental health system. According to Schaeffer Center research, Connecticut scores higher than the national average on per-capita mental health spending, Medicaid payment rates, and the number of mental health providers. However, Dr. Menchine pointed to the high rate of unmet need for mental health services nationally as an indicator that Connecticut’s mental health system still faces challenges reaching all individuals in need. Untreated mental illness is a large cost-driver for the nation’s economy and criminal justice system. The Schaeffer Center estimates economic burden of schizophrenia, bipolar disorder, and major depressive disorder is at least 1.4 billion dollars for each serious mental illness. Additionally, estimates indicate that Connecticut’s prison system spends over $149 million dollars annually on inmates with mental illness. Medicaid is the single largest payer of mental health services in the U.S., Craig Obey, Deputy Executive Director with the patient-advocacy group, Families USA, shared. Further, the expansion of Medicaid to low-income childless adults in recent years has made Medicaid an even more critical source of mental health funding. Obey emphasized that nearly one-third of the Medicaid expansion population has a mental health or substance use disorder. For Connecticut, 190,000 people are covered by Medicaid expansion, which has brought a total of 1.8 billion federal dollars into the state. Looking ahead to the future of Medicaid funding, Obey outlined federal proposals to re-finance Medicaid into a block grant or per capita cap system. Obey contrasted block grants and per capita caps, which set a fixed amount of federal funding per state and per enrollee respectively, with Medicaid’s current financing structure. Obey noted that these proposals could limit overall Medicaid funding, potentially shifting costs onto states. “Medicaid accounts for 25% of all US spending on mental health,” Craig Obey, Families USA. Rebecca Farley, VP of Policy and Advocacy with The National Council for Behavioral Health, recognized other important sources mental health services including the Mental Health Block Grant (MHBG) and state general revenue funds. Despite making up only 1% of the nation’s overall mental health spending, the MHBG plays a special role in paying for services that are not typically covered by Medicaid. Examples include Mental Health First Aid training, supportive housing and employment, and early intervention services. States also contribute a portion of their general revenue funds (GRF) to financing mental health programs. However, state GRF dollars dedicated to mental health declined during the 2008 recession and in response to Medicaid expansion. Moreover, many states including Connecticut face budget shortfalls, making an increase in state mental health spending unlikely. Farley identified typical actions states take when facing constrained budgets, including cuts to provider reimbursement, limitations of benefits, and restricted program eligibility. Farley drew key distinctions between Medicaid and other sources of funding like the MHBG, commercial insurance, and state dollars. Unlike state dollars and the MHBG, Medicaid expands or contracts to meet the need of the state’s population. Medicaid has low co-pays and no deductibles, making it the only path to affordable health insurance for many individuals. Notably, Medicaid generally covers medical innovations better than other payers. For instance, in some states, Medicaid funds long-acting injectables (LAIs), Assertive Community Treatment (ACT) teams, and telehealth services. The forum’s discussion ended with questions from attendees about how to ensure that mental health services are maintained or improved upon in any health care reform measures. Speakers encouraged advocates in the room to focus on educating legislative staff on how mental health services are funded and to share personal stories that illustrate the importance of mental health services. “All mental health funding sources are critical to closing the treatment gap for mental health services,” –Rebecca Farley, National Council for Behavioral Health.